WestEd will be present at the 2018 California Educational Research Association (CERA) 97th Annual Conference, held on November 12 through November 14, 2018, at the Disneyland Hotel in Anaheim, California. 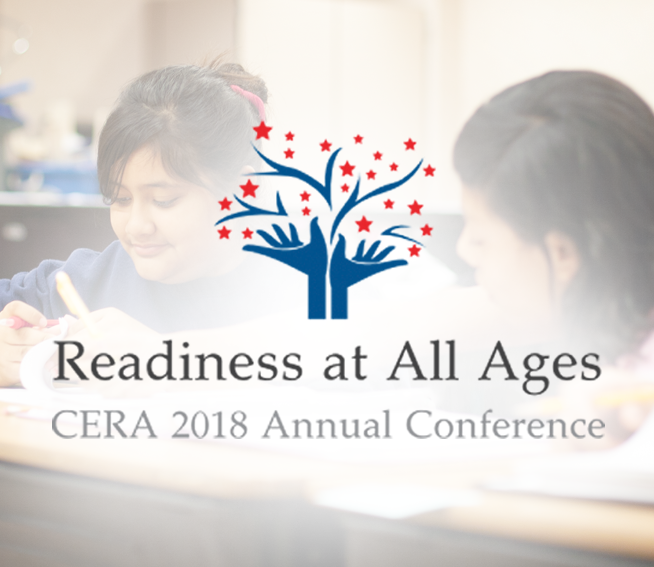 The 2018 conference theme is “Readiness at All Ages.” CERA will be highlighting best practices and tools that help individualize educational experiences for all children from birth through adulthood. This year, Deb Sigman, Interim Program Director for the Comprehensive School Assistance Program (CSAP) at WestEd, will receive the CERA Lifetime Achievement Award for her many years of leadership and service to California’s K–12 students. Sigman is a state and national education leader and works to connect assessment with enhanced student learning. She serves as CSAP’s Director of State Strategic Support and as Director of the California Comprehensive Center (CA CC), 1 of 15 Regional Comprehensive Centers funded by the U.S. Department of Education. The CA CC provides technical assistance to extend the capacity of the California Department of Education and other state-level stakeholders. Sigman also is the Senior Advisor to the Center on Standards and Assessment Implementation (CSAI), 1 of 7 National Content Centers. CSAI supports states’ implementation of their standards and assessment systems. Add WestEd’s sessions to your calendar and visit our display table at the conference to learn more about WestEd’s resources, research, and services.